How did an FTP-Stream transfer widget free up more than 100 hours a year for Exhibitree’s Creative Director? The answer is a simple data acquisition tool that's now delighting Exhibitree’s customers. Exhibitree is a 30 year-old business producing and manufacturing trade show displays and, more recently, experiential exhibits such as travelling roadshows. The team creates graphics in-house and supplies a range of clients in Canada and North America, ranging from start-up businesses to the provincial government in British Columbia. The Exhibitree team’s first experience of the Maytech platform was through one of its major clients, called Nomadic, which had already adopted the software. Beforehand Exhibitree used an old and basic FTP upload system. “It was causing so many issues and it was making a lot of work for our clients,” says Jodi, Creative Director at Exhibitree. “You had to be a techie to understand it. Clients had to download FTP software onto their own computers and some of the companies had to go through their IT departments to do that. Jodi spent on average two hours each week (or more than 100 hours every year) 'fighting FTP fires' and admits she delayed important tasks or arrived at work earlier than normal to make sure files were sent when they needed to be. The situation soon became untenable: the company’s brand and client relationships were being affected by the problem. So when the team re-launched the Exhibitree website, they knew the file-transfer system would be the first thing to change. Geoff, Creative Sales and Marketing Coordinator at Exhibitree, explains: “Our website and our system was designed 10 years ago and it worked fine for the first six or seven years, but then people started relying on simple online uploaders and ours became outdated – so people were using Dropbox and Yousendit. The team set up a meeting with Maytech online and, having agreed a deal, Exhibitree’s new custom designed and branded FTP widget went live within a few days. They signed up to Maytech’s service which is easily scalable as they expand. Maytech’s Widgets provide seamless website integration for fast file transfers between you and your clients and partners, all without ever leaving your website. The difference has been marked: clients are happy and Exhibitree can add fast and secure file transfer to its long list of positive attributes. Most importantly the Maytech service has saved over 100 hours a year in time spent aiding customers with file uploads which has increased their productivity. 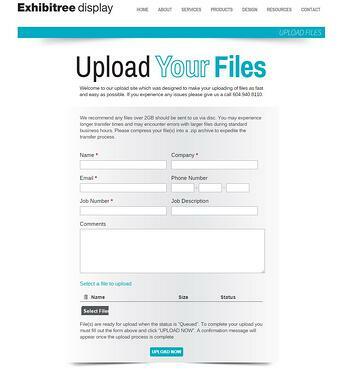 “Since we started using Maytech we haven’t had any problems with clients trying to get files uploaded. We don’t have to waste time taking people through a process step-by-step, and it has provided us an easy way to send files to clients,” says Jodi. Geoff adds: “It saves time during all the steps for us because we don’t have to explain the process to clients, we just send them direct to our website. 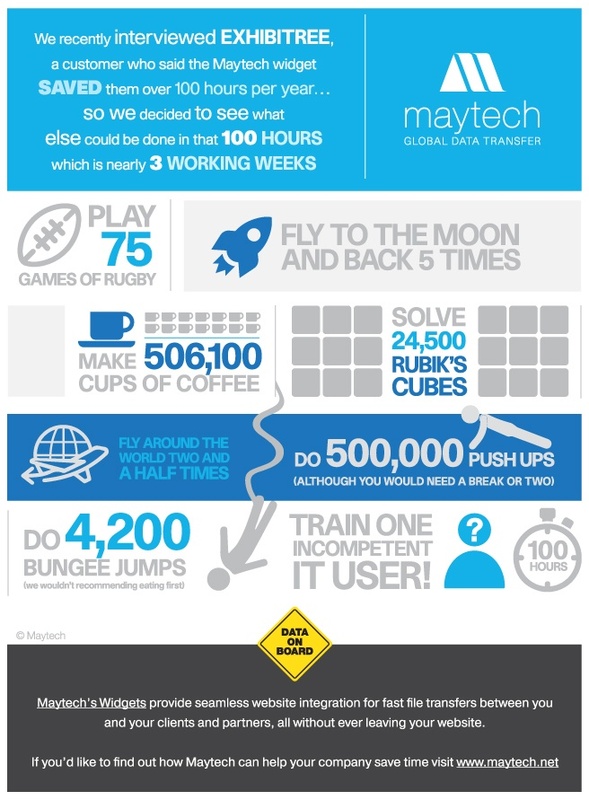 It’s all very self-explanatory now – before we had a full-page pdf just to explain how to log on to our FTP.” View our infographic on what you could do with your 100 hours saved a year.